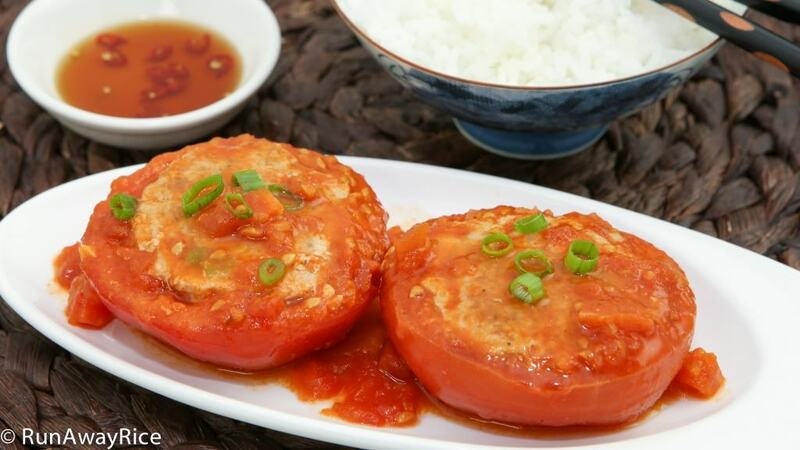 In this scrumptious Stuffed Tomatoes (Ca Chua Nhoi Thit) dish, juicy ripe tomatoes are filled with lightly seasoned ground pork and cooked in a zesty sauce. The best part about this dish: you make it using a single skillet. How’s that for one pot cooking?! Easy to prep and cook, you can enjoy a healthy and hearty dish in no time at all. It’s a wonderful dish to make during the busy work week. Keep this in your cooking repertoire and it’ll become a go-to dish. Enjoy! Use ripe tomatoes for the best taste and flavor. For this recipe, 5 ripe tomatoes is approximately 2 pounds. Each tomato half is filled with approximately 1.6 oz meat filling. I use a large cookie scoop to portion the filling so they are approximately the same size. I use an 80/20 ground pork mixture, 80% lean and 20% fat. This combo makes the filling nice and juicy. Substitute the ground pork with chicken, turkey or beef, whichever you enjoy. Optionally, use a vegetarian filling. If you’d like more sauce, add another chopped tomato and 1/3 cup more water. Adjust the tomato sauce to your taste by adding more/less sugar and fish sauce. 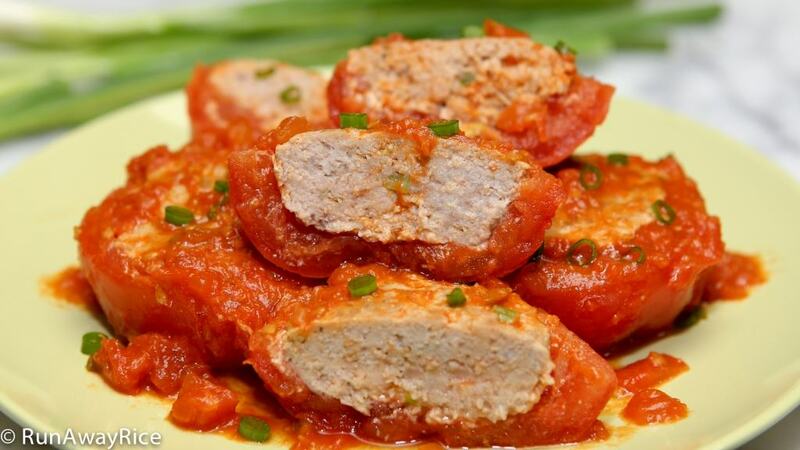 If you enjoy this recipe, you may also like: Easy-Bake Egg Meatloaf (Cha Trung) and Tofu in Tomato Sauce (Dau Hu Sot Ca). Wash the tomatoes with cold water and remove any stems. Cut off the bottom third of the green onions and then chop. Chop the green onion stems and transfer into a small bowl. Set aside for now. Peel, smash and mince the garlic. Remove the skin from the shallot and finely dice. Transfer the green onion bottoms, garlic and shallots into a small plate and set aside. Cut the tomatoes in half horizontally. Using a small knife, cut along the inside wall. Cut gently and use just the tip of the knife. While slowly rotating the tomato half in your palm, scoop out the center using a spoon. Transfer the core, seeds and juice into a small bowl. Continue coring all the tomatoes. Finely chop the tomato cores and return to the bowl. In a medium bowl, add the ground pork, the green onion bottoms, half of the minced garlic, half of the diced shallots, 2 tsp fish sauce and ground black pepper. Mix together combining all the ingredients well. Using a cookie scoop or spoon transfer a small amount of the filling into a tomato half. Continue until all the tomatoes are filled. Gently press down on the pork with your fingers pushing the filling into the tomato. Shape the filling into a slight mound instead of flat across. This elevates the tomato so it doesn’t get overcooked. Heat a skillet over Medium High heat and add 1 tsp vegetable oil. Add the tomatoes placing the meat side down. Cook for 8 minutes. During this time, rotate the tomatoes so the meat gets evenly browned. Transfer to a clean plate and set aside for now. Clean the skillet. Add 1 tsp vegetable oil, the remaining garlic, shallots and tomato paste. Stir-fry over Medium High heat for 10 seconds. Add the chopped tomatoes and water and combine together. Cover and cook on Low heat for 5 minutes. Add the sugar and fish sauce and stir together. Add back the tomatoes with the meat side facing up. Cover and cook on Low heat for 6-7 minutes or until the tomatoes are soft. Spoon the tomato sauce over the tomatoes and cook for another 2-3 minutes. Top with ground black pepper. To serve, transfer the Stuffed Tomatoes to a large plate, drizzle the tomato sauce on top and garnish with the chopped green onion stems. Enjoy while hot! 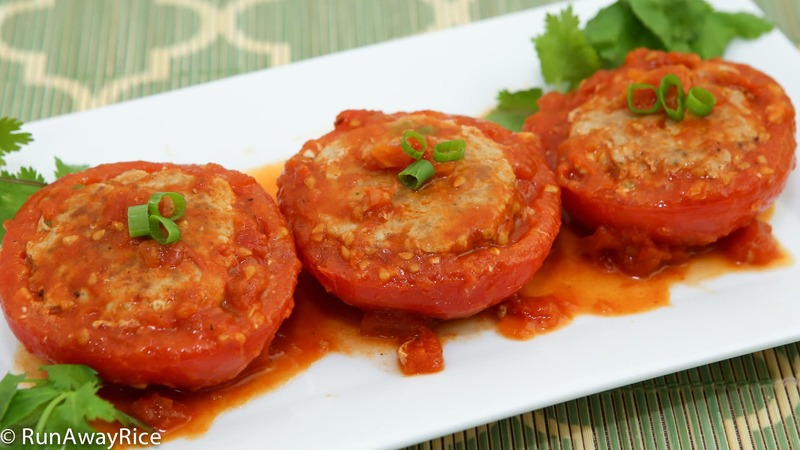 In this scrumptious dish, juicy ripe tomatoes are filled with lightly seasoned ground pork and cooked in a zesty sauce. The best part about this dish: you make it using a single skillet. How’s that for one pot cooking?! Easy to prep and cook, you can enjoy a healthy and hearty dish in no time at all. It’s a wonderful dish to make during the busy work week. Keep this in your cooking repertoire and it’ll become a go-to dish. Enjoy! Transfer the Stuffed Tomatoes to a large plate, drizzle the tomato sauce on top and garnish with the chopped green onion stems. Enjoy while hot! Use ripe tomatoes for the best taste and flavor. For this recipe, 5 ripe tomatoes is approximately 2 lbs. Delicious! Many thanks for posting this recipe. You’re welcome Philip. Enjoy the recipe! I made this for my friends last night. They loved it! That’s awesome! Thanks for trying my recipe and sharing your comments.